Arthur Suker was born in Cheshire and was the first cousin of the illustrator Walter Crane. Suker studied at the Birkenhead School of Art and was a watercolourist of landscapes and coastal scenes. Watercolour drawing reached its peak in popularity and usage in Victorian Britain. It first became popular during what is known as the 'Golden Age' of watercolour, which dates roughly from the mid-eighteenth to the mid-nineteenth Century. Watercolour was a medium that suited both professional and amateur artists. It could be easily used outdoors, which appealed to artists who wished to paint 'en plein air' (in the open air) in order to capture the transient nature of weather and light within a landscape. This desire to capture the landscape in all its forms using watercolour, ranging from the tranquil to the dramatic and even dangerous, was exemplified by the artist J M W Turner, who portrayed the British landscape with an expressiveness that had not been seen previously. 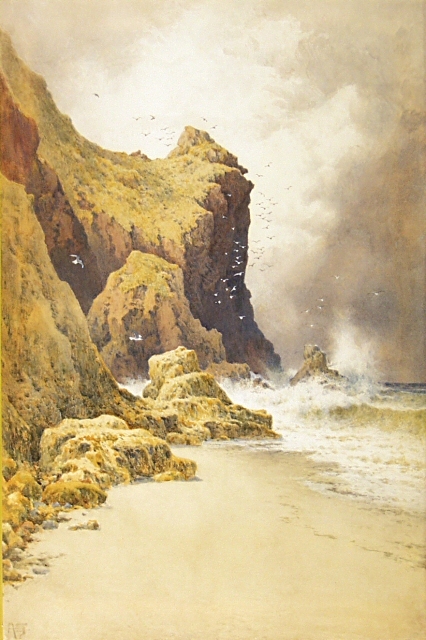 Throughout the 19th century artists such as Arthur Suker continued to illustrate the sublime nature of landscapes and coastal scenes through the medium of watercolour. In 'A Stormy Coastal Scene', Suker has directed the drama to the right of the picture. The gulls suddenly taking flight and the crashing waves against the dark menacing sky suggest the start of a storm brewing.